Photo: James Ransom from Food52 Any Night Grilling by Paula Disbrowe. Is there a better package to open than one containing tender potatoes, browned onions, and creamy goat cheese? We’ve made these potato-and-cheese packets at home as a satisfying main course and on camping trips to serve with grilled steak or pork chops. The prosciutto is optional, but it adds incredible flavor, and the fat bastes the potatoes as they cook. 1. Prepare a charcoal grill for two-zone cooking and build a medium fire, or heat a gas grill to medium-high. Carefully wipe the preheated grates with a lightly oiled paper towel. Using a grill brush, scrape the grill grates clean, then carefully wipe with a lightly oiled towel again. 2. In a large bowl, generously season the potatoes, onion, olive oil, and thyme with salt and pepper and toss to combine. Cut four sheets of heavy-duty aluminum foil into 14- by 8-inch rectangles and place them shiny side down. Scoop one-quarter of the potato mixture in the middle. 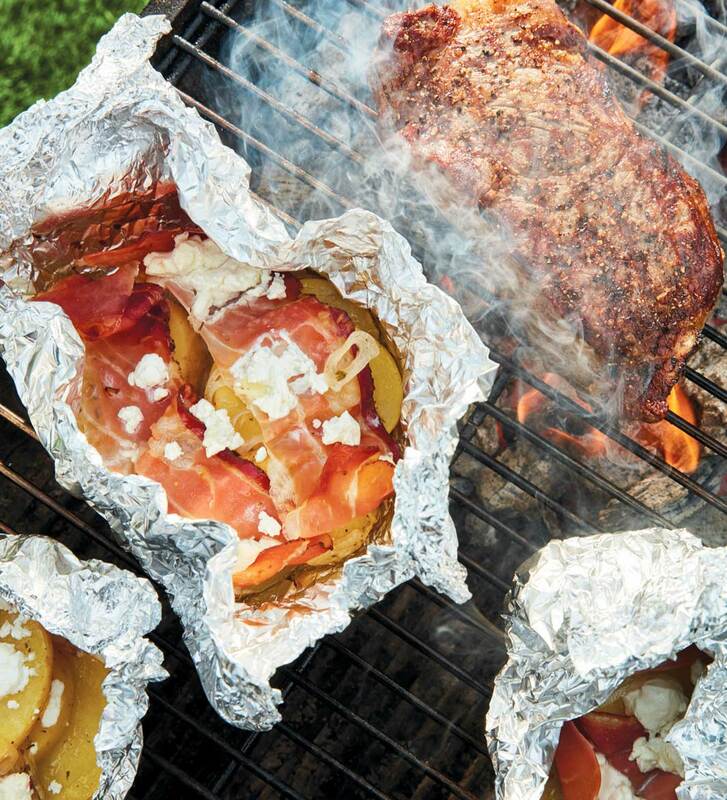 of the foil over the potatoes and bring the top and bottom edges together. Fold the edges over several times to make a tight seal. Prepare the remaining packages the same way. 3. When you’re ready to cook, place the foil packages on the grate over indirect heat. Close the grill (venting appropriately for indirect cooking) and cook, rotating every now and then for even cooking, until the packets are puffed and the potatoes are tender, 30 to 40 minutes. To test for doneness, open 1 small corner of a packet (using caution as escaping steam will be very hot) and use a paring knife to pierce (and/or taste) a portion. Serve warm.